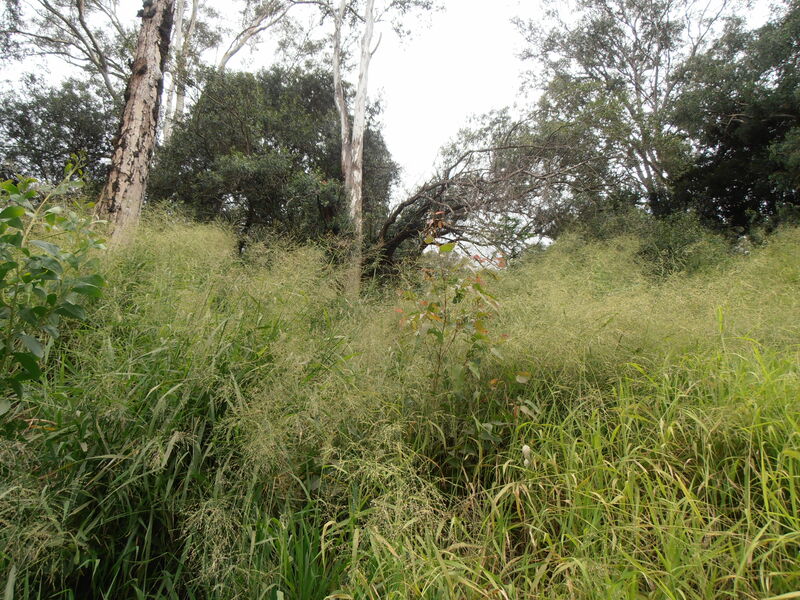 Our property was registered under the Land for Wildlife program administered by the Brisbane City Council in September, 2010.
a gift of the book Wild Plants of Greater Brisbane by the Queensland Museum , 2003.
workshops on photography of wildlife – something we need to do! 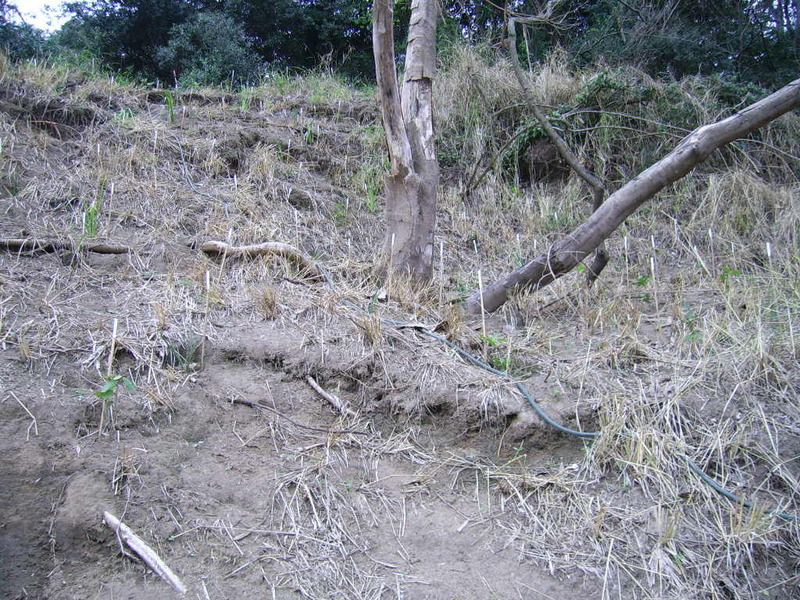 Assistance with erosion after the flood. 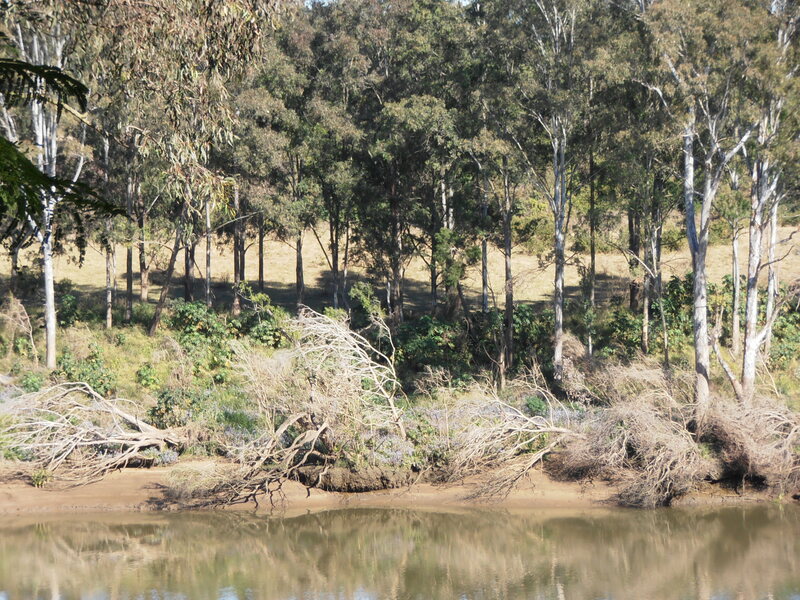 Even one year after the flood the state of the riverbank on the opposite side to our land is pretty much is a mirror of both sides of the river in either direction. 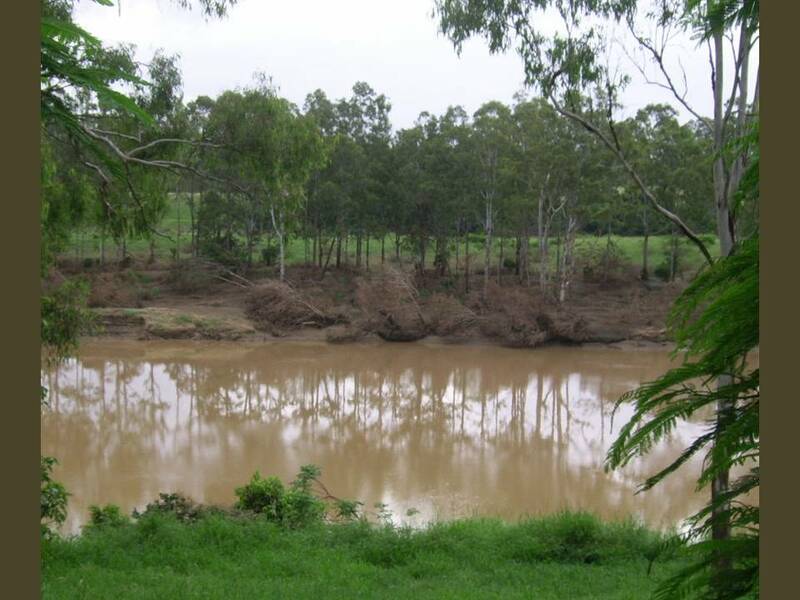 Immediately after the flood the riverbanks were covered in slippery mud, the smaller trees (bottlebrush, she-oaks, Chinese Elms, axe-handle trees and native figs) were either snapped off or bent sideways. There was an unusual deposit of sand all along the edge of the river and the mangroves had all died, presumably from being covered with water for a considerable amount of time. 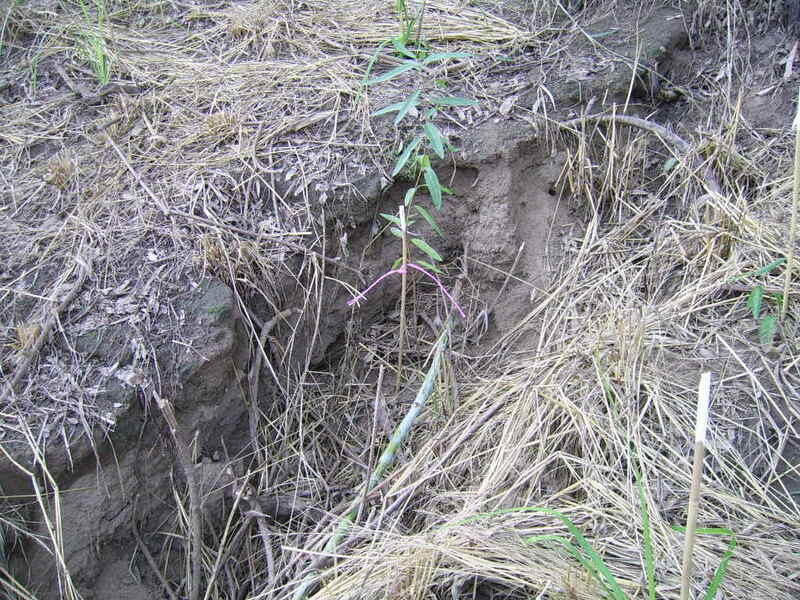 After a while the grass grew back and covered up the deep damage and collapse of soil and vegetation. 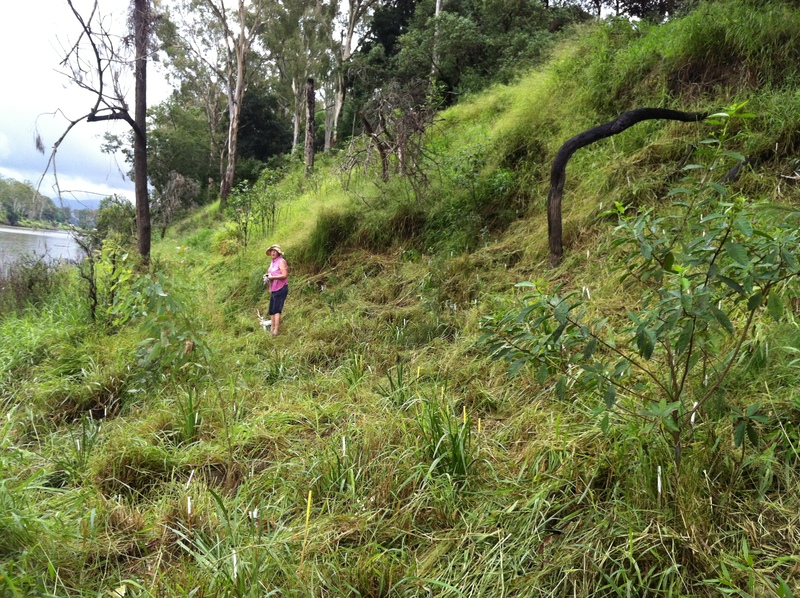 Along with the grass (which we hacked our way through) came the ubiquitous castor oil plants and a plethora of weeds – click on the photo above on the right to zoom in to all the castor oil plants and billygoat weeds. 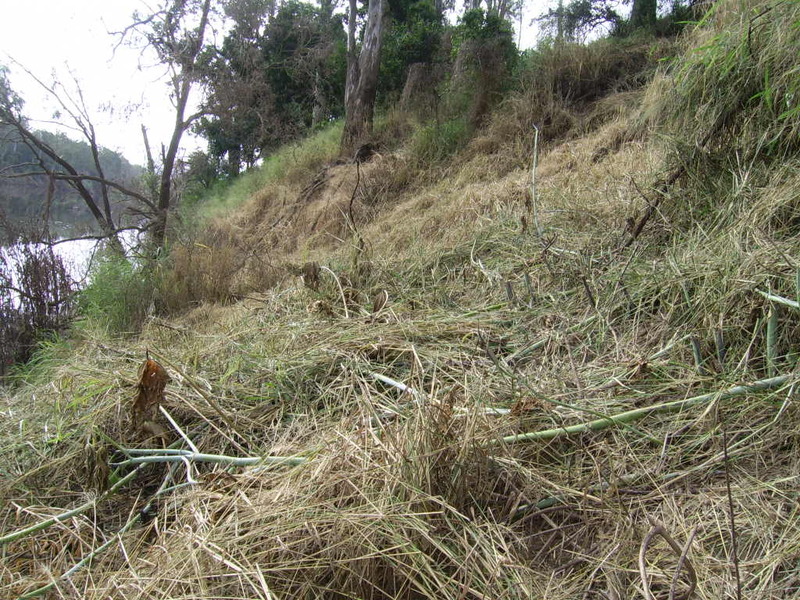 The one good thing was that the flood had been successful at tearing out the infestation of riparian weeds along another longer part of the bank that had made the area virtually impenetrable. 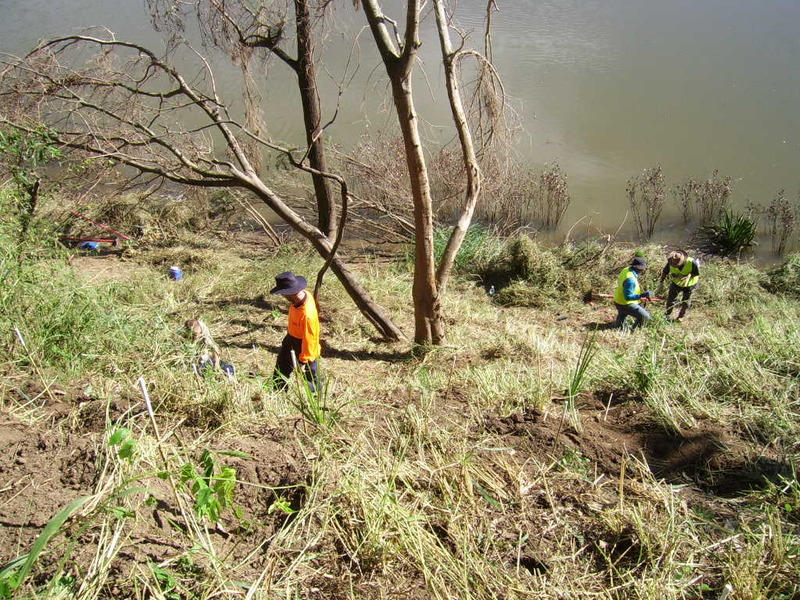 However the task of restoring the riverbank seemed mammoth. Ian contacted our LFW Program Officer to see whether there was any assistance we could be given. 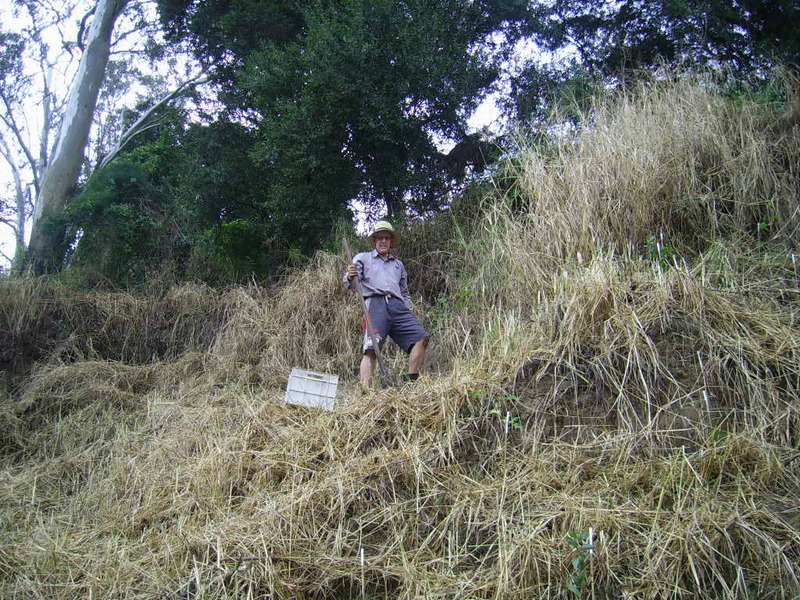 He advised Ian to spray the grass and weeds to prepare the site. 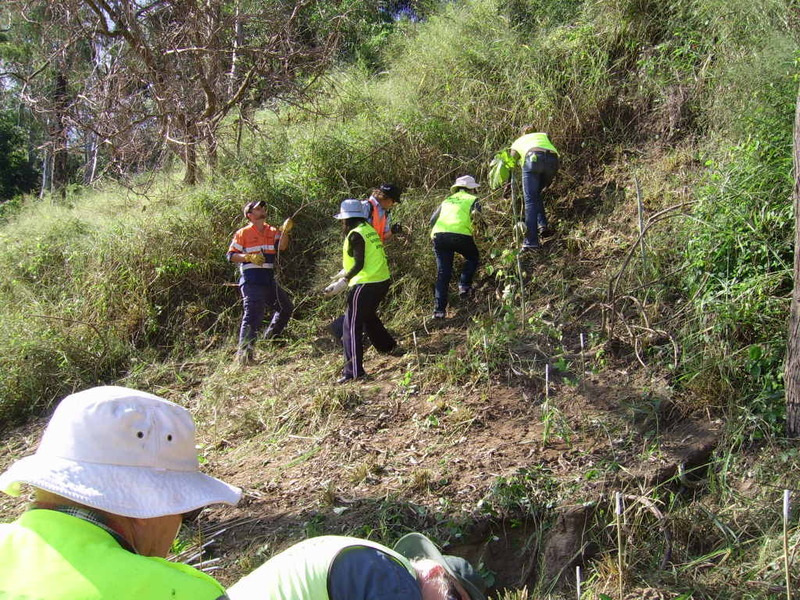 In due course LFW delivered 800 native plants suited to Moggill riverbank conditions and arranged for a team of Conservation Volunteers Australia to come for three days to start the project. 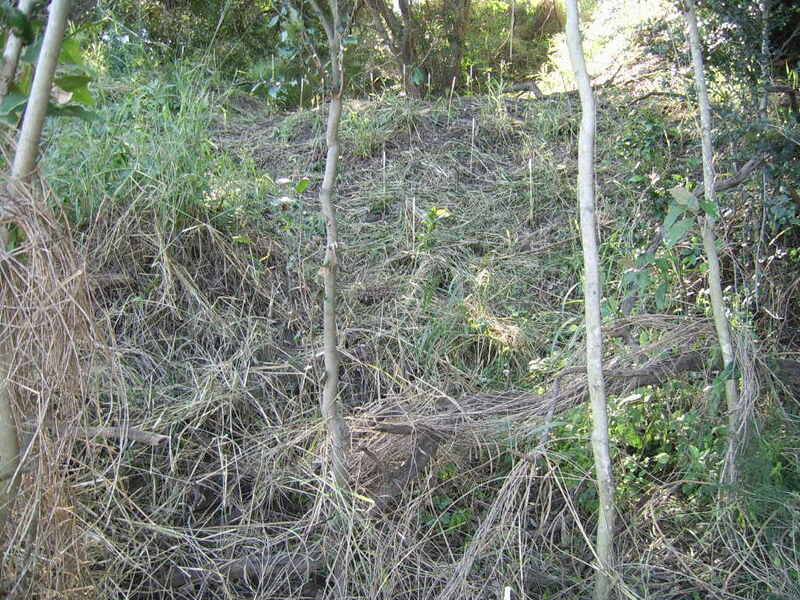 They managed to remove a lot of debris – not to mention some ‘bougainvillea’ that the site was riddled with. 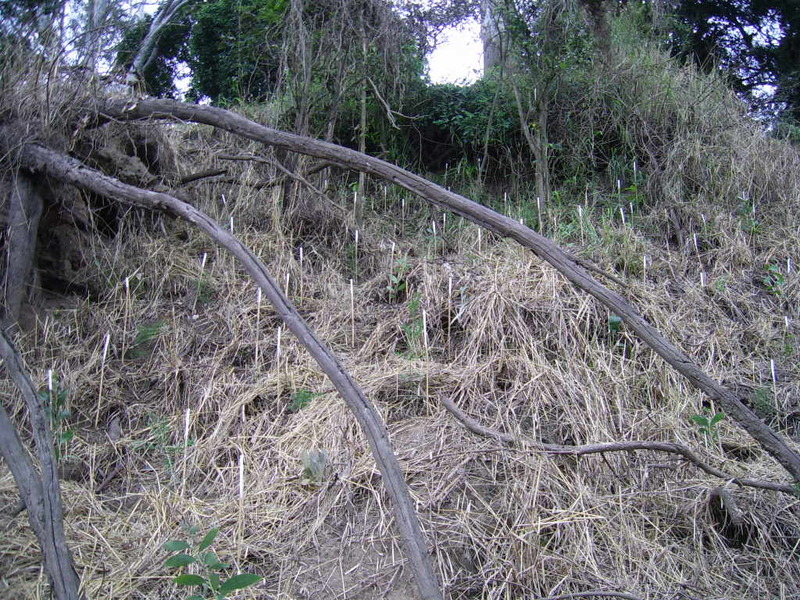 (We had thought this was a pest called Cat’s Claw and had cut it back in another section of our riverbank. It was a particularly vicious plant which would go through protective clothing, deep into the skin and hurt for a long time afterwards. Ironically our Program Officer later identified it as Cockspur, a native plant, and it’s deep rooting nature had probably been another factor in holding the soil in some places!) They stacked all the dead wood etc. 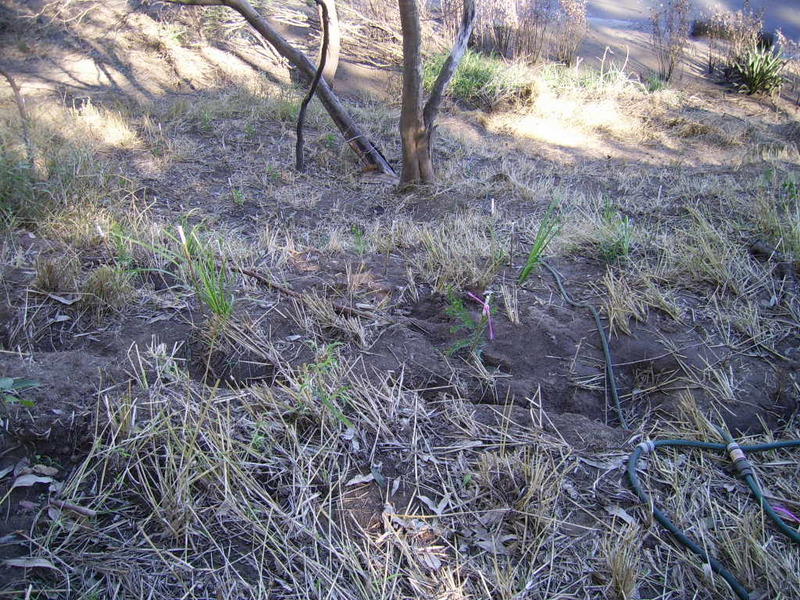 along the river’s edge creating a kind of levee and then they started planting, using stakes we had pre-painted. 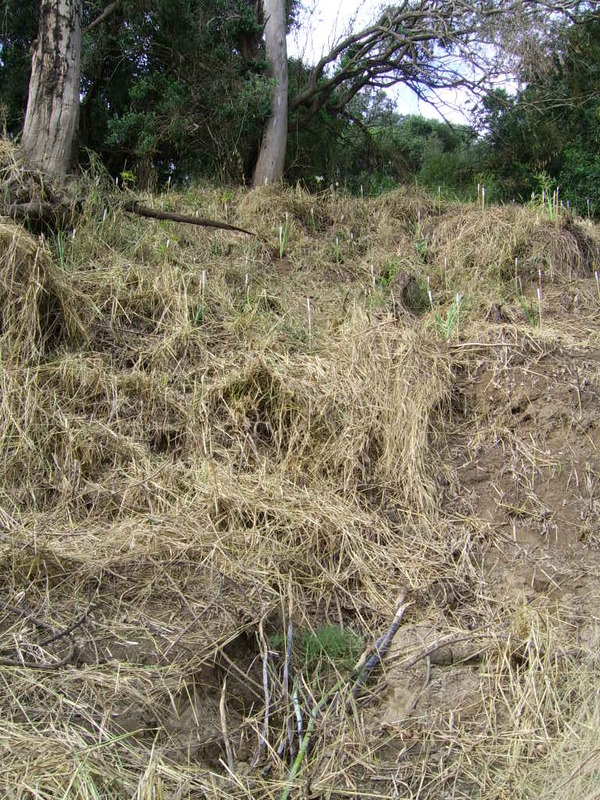 They could only manage to do three of the eight bays of collapsed bank because the site was so steep and faced into the hot western sun…even getting the plants down to the site had taken a lot of time and energy. The bank is fragile as it has collapsed at multiple levels. Ian sprayed the next five bays and later with one of our sons, Luke, whipper-snippered and planted the remaining tubestocks. Finally the site was a host of stakes with plants! 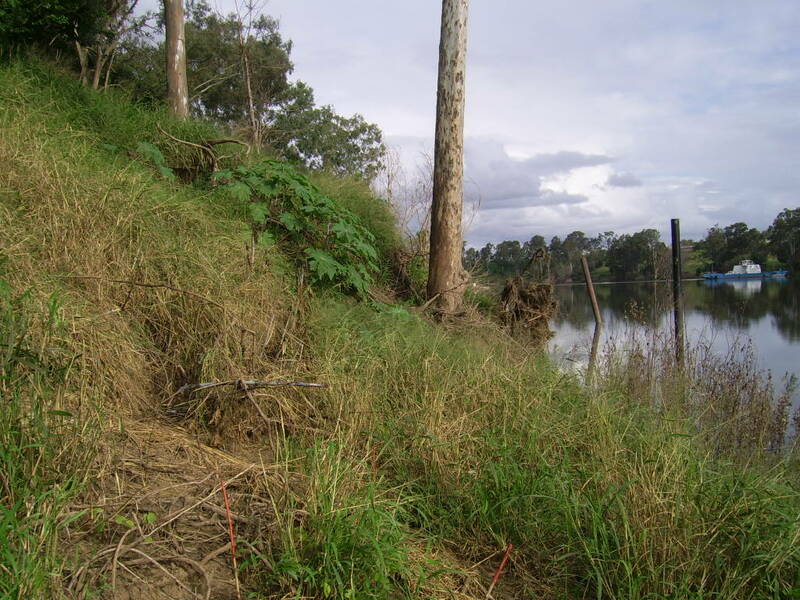 Of course the task now was to keep the plants watered (we connected hose lengths and pumped water from the dam) and to weed, weed, weed – particularly for tiny Chinese Elms, glycine, flat weeds, balloon vines and asparagus fern. 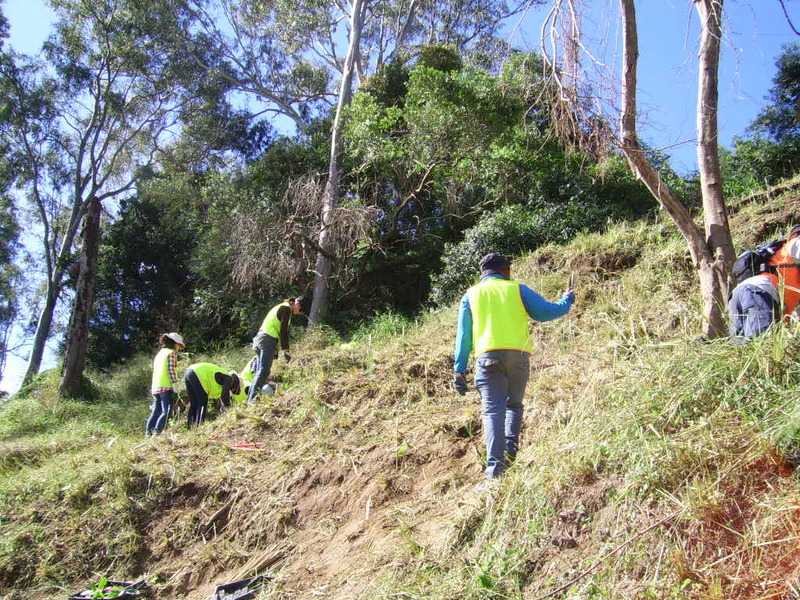 We even felt so motivated that we cleared and planted above the ridge of the bank in an area we refer to as the groves. Ordinarily, Land For Wildlife do not recommend taking in large areas when restoring the bush, but we felt on this occasion we had been given a window of opportunity and decided to seize it. With good rain and plenty of warm sunshine this area that was planted in May and June underwent steady, strong growth. This meant that we had to go over the area every few weeks and cut back the grass so the plants would not be smothered – the paint on the stakes was a great help for locating the plants and the cut grass became ready-made mulch. When we went away at the end of Spring we were confronted on our return by a wall of grass with a few tall plants keeping their heads above it – thankfully most plants were still thriving when the grass was cut back. Later when there was a long period of hot dry weather the tall grass had the advantage of protecting the new plants from the western sun. 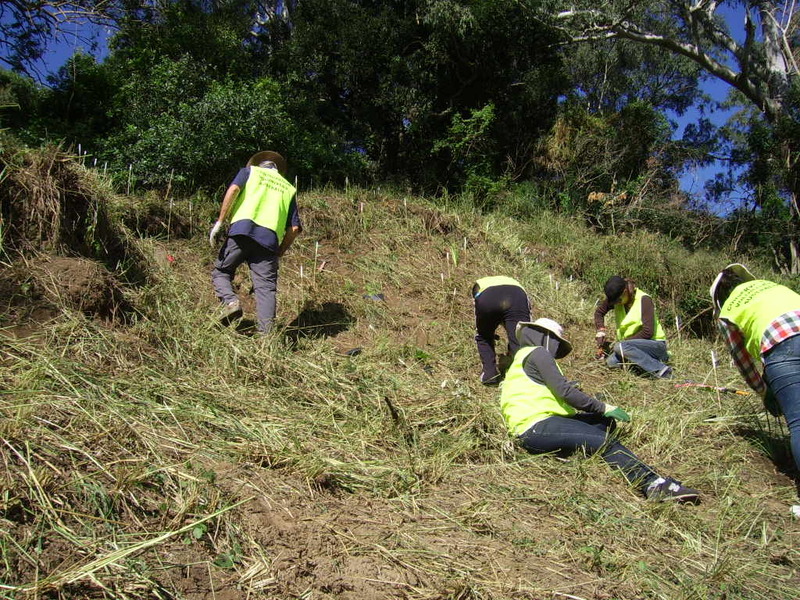 Sometimes there is nothing else to do except start again – working our way across the bays, clearing the grass by hand – using a kamakiri, a small scythe. 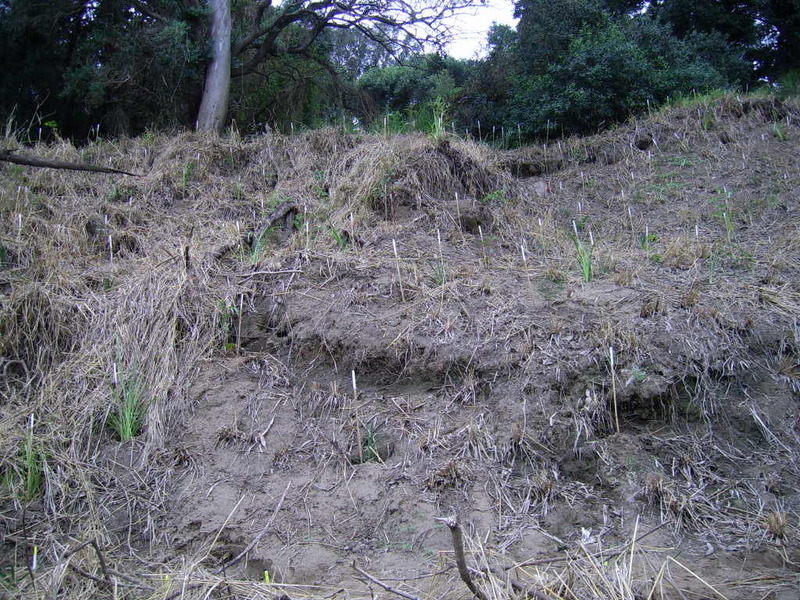 However we do not complain about the grass – it is a strong grass that may be a legacy of good pasture for dairy cows – as it holds the soil weakened by the flood and it keeps weeds more under control. 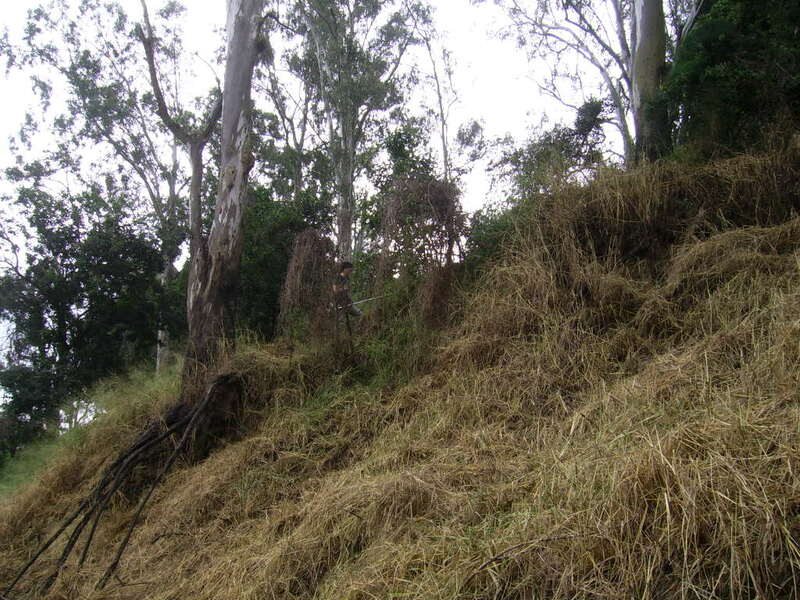 Also by hand slashing we are on eye-level with small weeds and can deal with them immediately.